On 15 January (Lunar New Year) every year, the festival Ná Nhèm (face painting in Tày people language) takes place in Tran Yen Commune, Bac Son. In essence this is the worship of the village’s Hoang Thanh, the guardian of the village, and also the praying for peace, for the New Year season. 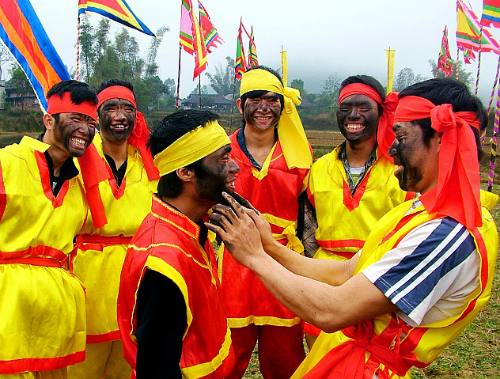 Especially when participating in the festival, men in the village will paint black ink on the face, disguising as the enemy “Sấc Tài Ngàn” and join a wargame to remind the younger generations about the history of the Founders. The villagers believe that doing so would distract the enemy spirits. Through the festival they will see their defeats were repeated and the evil spirit will leave the ground. Beating drums festivals is one of the Ma Coong festivals in Bo Trach, West of Quang Binh province, which took place on 16 January every year. According to the legend, the festival was originated from the golden monkeys often destroy the crops of the Ma Coong . 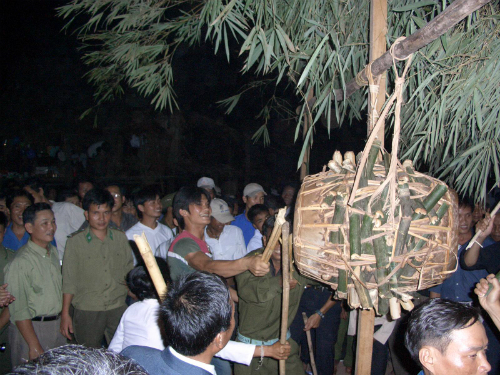 To chase the evil monkey, people here joined together to make a big drum and carry it to the farm, and beat the drum around the clock. Drums shook the mountains that frightened the monkeys; they flee, and do not dare to return to harass the villagers again. At the festival, the village boys beat the drum for good weather, fresh rice, corn, and health.